PARIS and NEW YORK – (April 8, 2019) —EcoVadis, the world’s most trusted provider of business sustainability ratings, has been named one of Spend Matters’ 2019 50 Providers to Know. EcoVadis was selected for its proven ratings methodology, interactive platform and expert support services that comprise its sustainability intelligence suite. EcoVadis recently released its expanded, full-spectrum suite of sustainability risk and performance management tools that offer supply chain and procurement teams broad-scale risk screening and mapping, reliable scorecards with actionable ratings and complete audit and improvement management capabilities. 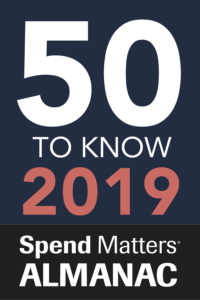 Spend Matters 50 Providers to Know and Watch lists are annual accolades awarded to the best-in-class providers and innovators in the procurement and supply chain space. Winners are selected with specific criteria in mind, as well as comprehensive collaboration among all Spend Matters analysts and reflect the publication’s unbiased, independent view of the organizations nominated. This is the fifth straight year EcoVadis has made the Spend Matters 50 to Know and Watch lists — EcoVadis was named a Provider to Watch in 2015 and 2016, and has been recognized as a Provider to Know for the past three years. To learn more about how EcoVadis helps organizations drive sustainability improvements in their supply chains, please visit www.ecovadis.com. EcoVadis is the world’s most trusted provider of business sustainability ratings, intelligence and collaborative performance improvement tools for global supply chains. Backed by a powerful technology platform and a global team of domain experts, EcoVadis’ easy-to-use and actionable sustainability scorecards provide detailed insight into environmental, social and ethical risks across 198 purchasing categories and 155 countries. Industry leaders such as Johnson & Johnson, Verizon, L’Oréal, Subway, Nestlé, Salesforce, Michelin and BASF are among the more than 55,000 businesses on the EcoVadis network, all working with a single methodology to evaluate, collaborate and improve sustainability performance in order to protect their brands, foster transparency and innovation, and accelerate growth. Learn more on ecovadis.com, Twitter or LinkedIn.